I always think of this duck joke every time I pull more fresh loaves from the oven or when I see a family of wild wood ducks taking a fancy to our swimming pool. Both trigger a “Got any Bread” moment, but with entirely different emotions. At least it’s a lot better than the typically imbecilic jokes contained in Christmas bon bons. Who writes these Christmas jokes and why do we feel so compelled to read them aloud? Today’s festive olive bread is a super easy yeasted bread bound to stay moist. While dark looking and rustic in appearance, due to the olives, rosemary and olive oil worked into the dough at the first kneading stage, it is still a light bread. The recipe comes from Maggie’s Table. * I like the simplicity of this version, especially when time is precious at Christmas. You can make these lovely loaves in less than two hours with lots of resting time in between to indulge in a Christmas drop or two. Combine yeast, sugar, and warm water in the mixing bowl of a stand mixer. Leave for 5 minutes. Then add the flour, salt, rosemary and olives. Mix with the paddle till the dough comes together, then swap to a dough hook ad mix for a few minutes. Turn the dough out onto a floured work surface and knead gently for another five minutes. The dough is meant to be quite moist and sticky, however you may need to add a little extra flour along the way. Turn into a clean and lightly oiled bowl and brush the top with a little olive oil. Cover the bowl and leave until doubled in size ( about 1 hour). Divide the mixture into two portions and shape into loaves. Brush a baking tray with olive oil and leave the loaves to rise, covered, on the oiled tray for a further 20 minutes. Meanwhile heat the oven to 220c FF. Bake the loaves for 20 minutes, then reduce the temperature to 180c and bake for a further 20 minutes. Cool on a wire rack before cutting. Makes two loaves, one for me and one for the freezer. *Maggie Beer, Maggie’s Table, Penguin 2005. Gifted to me by the Richard’s family after the fire. Thanks Christine and Peter. Posted on December 20, 2015 December 20, 2015 Author FrancescaCategories Bread, Budget, RecipesTags bon-bons, bread, Christmas, festive breads, jokes, olives, pane con rosemarino e olive, rosemary, yeasted breads31 Comments on Got any bread? 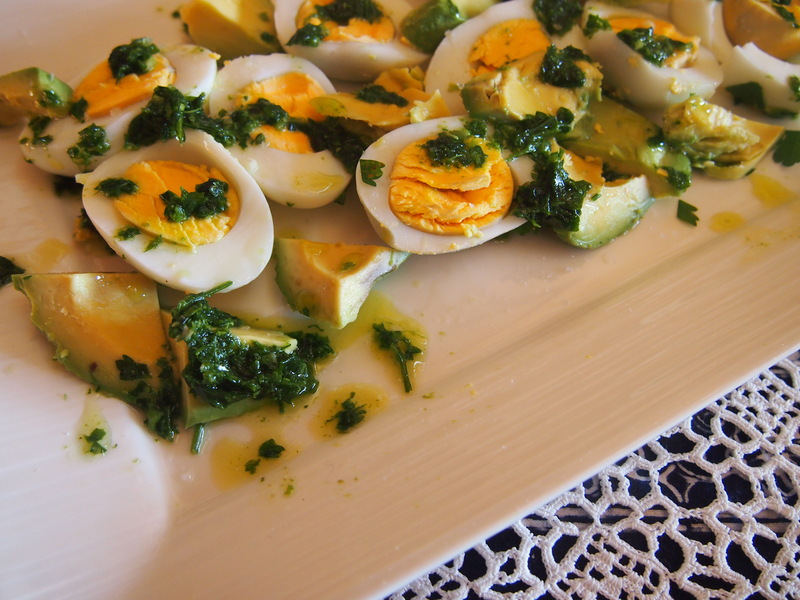 Antipasto of Egg Salad with Parsley Pesto. Essere Come Prezzemolo is a handy Italian expression. It simply means to be like parsley, and is applied to people who turn up everywhere, or are always there. ( Steven Fry comes to mind ) Thank goodness parsley is always in my garden as it forms the backbone of many a meal. It flavours stock, is the main star in tabbouleh and it is sprinkled over many a dish, like confetti at a wedding, or a last blessing from the kitchen. This little salad always gets eaten first at any family gathering. The young wolves descend on it.It is an economical starter, especially if you grow parsley which is really like a weed. Serve this with another salad, some herbed olives and a tasty bread for lunch. 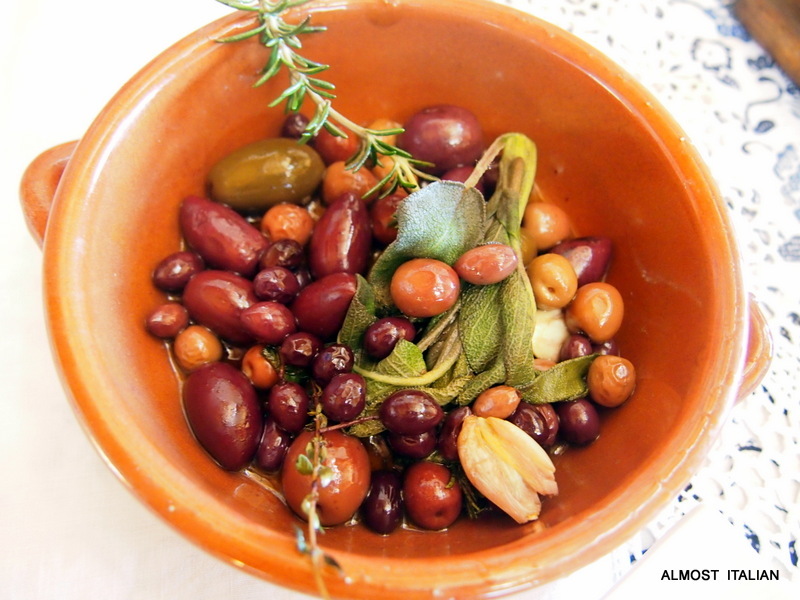 Mt Zero Biodynamic olives, warmed with oil, garlic and herbs. The dish employs winter produce at its peak. Avocados, which are cheap in July and August, come from our sunnier northern states. Parsley is always prolific in the garden but more so in winter as it tends to ‘bolt’ in summer. The eggs are free range organic bantam eggs but any small sized organic eggs you can get hold of will go well as they are the star. 1 large avocado, or more as required. Hard boil the eggs. Meanwhile make the parsley pesto in a mortar and pestle. Throw in the peeled garlic and some coarsely ground salt. Begin pounding. Add the pine nuts and continue pounding. ( Think of your least favorite politician). Add the leaves from the parsley bunch, a bit at a time. Continue bashing away until the parsley is broken down but still a little rough in texture. Add the oil, continue pounding, and add enough to make a green sauce, runny enough to drizzle. Arrange the halved eggs and avocado chunks on a platter, drizzle with the parsley pesto, and add another grinding of salt. I usually reserve the term pesto for the classic basil pesto which I only make in Summer. This one is so similar, and the green is so vibrant, I’m allowing it to sneak into the pesto category. 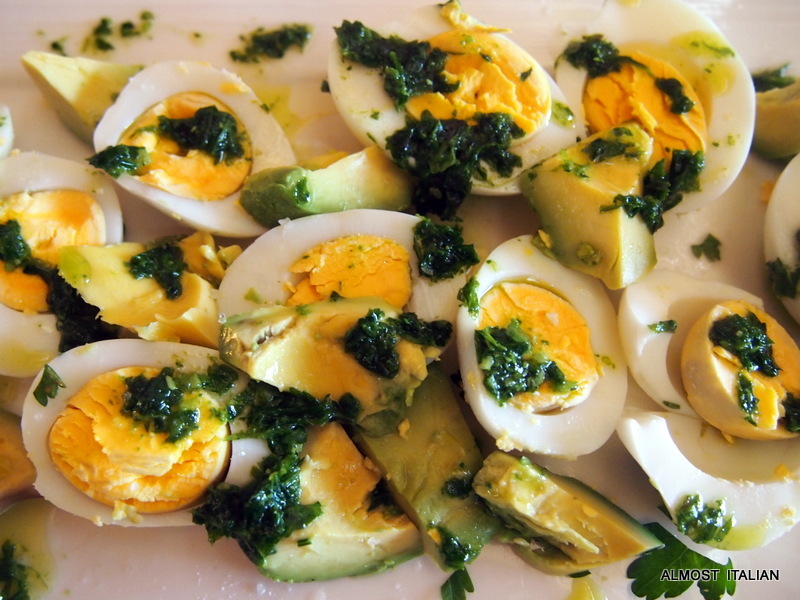 Posted on August 12, 2014 Author FrancescaCategories Budget, RecipesTags avocado, eggs, herbs, Italian idiom, Mt Zero olives, olives, parsley, recipe, Vegetarian21 Comments on Antipasto of Egg Salad with Parsley Pesto.